Name:Frequency Converter Model:893727 Specifications: Power:5.5KW Input:AC 3PH 380V 50Hz-60Hz Output:AC 3PH 0V-380V Temperature: -40°C+70°C Modulation: Space Voltage Vector Modulation Cooling method: air-cooled, with fan control Color:Black Size:210mm155mm116mm Feature -The control panel is simple and easy to understand. 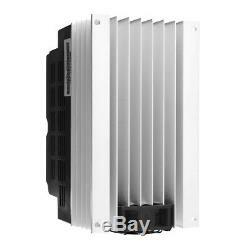 Quick heat dissipation and longer service life. Through the built-in PLC or control terminals to achieve multi-speed operation, operation panel, control terminals can be switched through a variety of ways. LED display set frequency, output frequency, output voltage and output current and other parameters. Strong anti-interference ability, large low-frequency torque, high precision Safety Precautions: 1. Before wiring, make sure the input power is off 2. Wiring operation, please professional electrical engineering personnel to carry out 3. Ground terminal, be sure to ground 4. After the emergency stop circuit wiring is completed, be sure to check whether the action is valid. 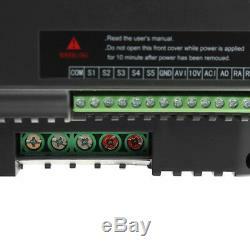 The output line of the inverter should not be connected with the shell, and the output line must not be short-circuited 6. 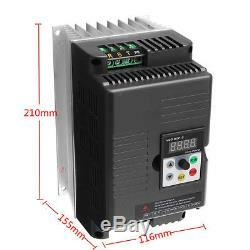 Check if the voltage of the AC main circuit power supply matches the rated voltage of the inverter. Do not perform withstand voltage test on the inverter 8. Please connect braking resistor according to wiring diagram 9. Do not connect the power cord to the output U, V, W terminals 10. Do not connect the contactor to the output circuit 11. Be sure to install the protective cover before power on. When removing the cover, be sure to disconnect the power supply. Select the inverter with reset and retry function, do not approach the mechanical equipment, because the alarm will suddenly restart when stopped 13. After confirming that the operation signal is cut off, the alarm can be reset. 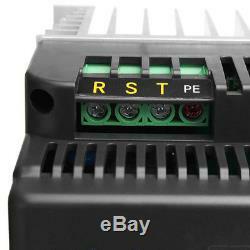 Alarm reset under running signal status, inverter has May suddenly start 14. Do not touch the terminal of the inverter, there is a high voltage on the terminal, it is very danger 15. Don't change wiring and terminal disassembly after power on 16. 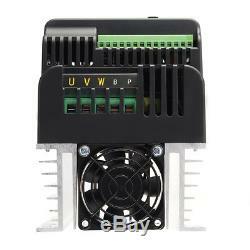 Cut off the main circuit power before inspection and maintenance 17. 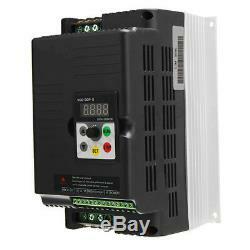 Do not modify the inverter Package include: 1 x Frequency Converter 1 x English Manual. 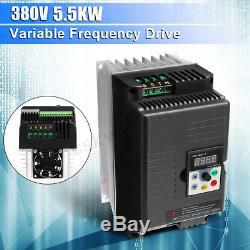 The item "5.5KW 380V 3 Phase VFD Variable Frequency Drive Inverter Motor Speed Controller" is in sale since Wednesday, January 2, 2019. 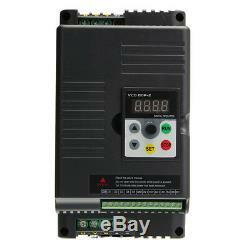 This item is in the category "Business, Office & Industrial\Automation, Motors & Drives\Other Automation Equipment". The seller is "cskwin2015" and is located in HK. This item can be shipped worldwide.